For over two decades, this comprehensive manual has been the standard introduction and complete reference for writing articles and books containing mathematical formulas. If the reader requires a streamlined approach to learning LaTeX for composing everyday documents, Grätzer’s © 2014 Practical LaTeX may also be a good choice. 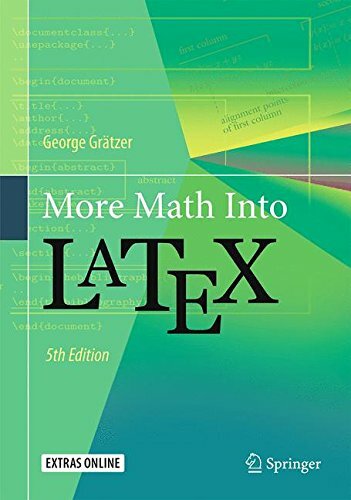 In this carefully revised fifth edition, the Short Course has been brought up to date and reflects a modern and practical approach to LaTeX usage. New chapters have been added on illustrations and how to use LaTeX on an iPad. Grätzer’s book is a solution. There are several LaTeX guides, but this one wins hands down for the elegance of its approach and breadth of coverage. View More In Databases & Big Data. If you have any questions about this product by George Gr tzer, contact us by completing and submitting the form below. If you are looking for a specif part number, please include it with your message.